Dwarf flowering pomegranate is a showy, dense dwarf shrub that displays attractive orange-red single flowers at an early age, followed by colorful fruit. Excellent for containers or for use in the garden. Effective bonsai. Deciduous. Moderate grower to 3 ft tall and wide or clip to shape. Full sun. Hardy to 0 to 10°F. A tough, hardy plant with many benefits. 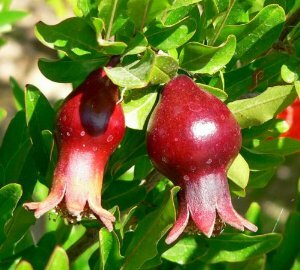 Dwarf flowering pomegranate is a showy, dense dwarf shrub that displays attractive orange-red single flowers at an early age, followed by colorful fruit. Excellent for containers or for use in the garden. Effective bonsai. Deciduous. Moderate grower to 3 ft tall and wide or clip to shape. Full sun. Hardy to 0 to 10°F. Shipped as a potted 4" pot plant in its original soil and container. We sell these in a 4 inch pot and a quart container.